Newark is a city in New Castle County, Delaware, 12mi west-southwest of Wilmington. Kids will appreciate attractions like Hersheypark and Winterthur Museum, Garden & Library. You'll find plenty of places to visit near Newark: Longwood Gardens (in Kennett Square), Brandywine Battlefield (in Chadds Ford) and Harrah's Philadelphia (in Chester). The adventure continues: find something for the whole family at Dutch Wonderland, enjoy some diversion at Village Greens Miniature Golf, get engrossed in the history at Railroad Museum of Pennsylvania, and immerse yourself in nature at White Clay Creek State Park. To see other places to visit, where to stay, maps, and tourist information, go to the Newark trip itinerary site . Albany to Newark is an approximately 4-hour flight. You can also drive. June in Newark sees daily highs of 82°F and lows of 63°F at night. Finish your sightseeing early on the 28th (Fri) to allow enough time to travel to Virginia Beach. 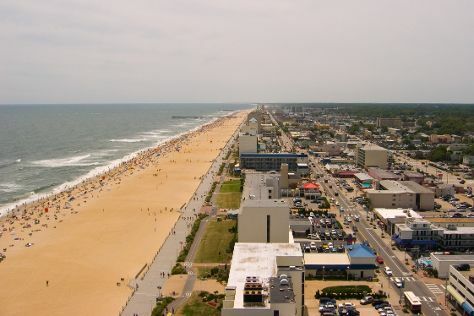 Holding a record for the longest pleasure beach in the world, Virginia Beach showcases 35 miles of coastline and maintains a longstanding reputation as a family-friendly vacation destination. You'll visit kid-friendly attractions like Virginia Aquarium & Marine Science Center and Virginia Beach. Get out of town with these interesting Virginia Beach side-trips: Parasailing & Paragliding (in Duck), Wright Brothers National Memorial (in Kill Devil Hills) and Jockey's Ridge State Park (in Nags Head). Next up on the itinerary: take a leisurely stroll along Virginia Beach Boardwalk, examine the collection at Virginia Beach Surf & Rescue Museum, enjoy the sand and surf at Sandbridge Beach, and explore and take pictures at Hunt Club Farm. To see traveler tips, where to stay, maps, and more tourist information, use the Virginia Beach travel route planning tool . The Route module can help you plan travel from Newark to Virginia Beach. Plan for a bit warmer nights when traveling from Newark in June since evenings lows in Virginia Beach dip to 69°F. Finish your sightseeing early on the 2nd (Tue) so you can drive to Williamsburg. Kids will enjoy Busch Gardens Williamsburg and Water Country USA. There's lots more to do: browse the exhibits of Colonial Williamsburg, make a trip to Jamestown Glasshouse, pause for some serene contemplation at Bruton Parish Episcopal Church, and steep yourself in history at Governor's Palace. Plan my trip to Williamsburg with suggested itineraries provided by Inspirock. You can drive from Virginia Beach to Williamsburg in 1.5 hours. Other options are to take a bus; or take a bus. Expect a daytime high around 91°F in July, and nighttime lows around 73°F. Finish your sightseeing early on the 6th (Sat) to allow enough time to travel to Goochland. Goochland is a census-designated place (CDP) in and the county seat of Goochland County, Virginia, United States. Start off your visit on the 7th (Sun): get outside with Cavalier Sporting Clays and then do a tasting at Byrd Cellars. To find maps, other places to visit, traveler tips, and tourist information, read Goochland online trip builder . Drive from Williamsburg to Goochland in 1.5 hours. Plan for little chillier nights when traveling from Williamsburg in July since evenings lows in Goochland dip to 68°F. Wrap up your sightseeing on the 7th (Sun) early enough to travel back home.